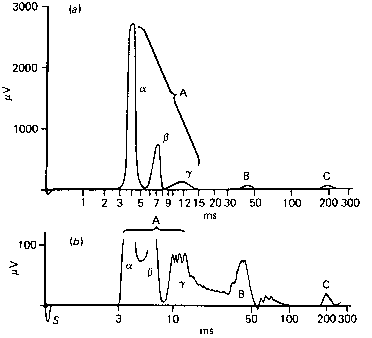 Manual volumetry was performed on ten individuals (seven male and three female) with ChAc confirmed genetically or with the chorein Western blot. Region-of-interest (ROI) volumetry analyses remain the "gold standard" for determining volumetric change in morphometry studies, as they are not susceptible to a number of the statistical methodological difficulties that plague VBM research, such as the introduction of shape differences through misregistration during normalization ; the displacement of true differences through choice of smoothing kernel, which is often arbitrarily chosen without reference to the size of expected anatomical change ; and the inability of the method to take into account local sulcal/gyral variability . VBM is probably not well-suited to detection of subtle change, but its inherent methodological problems are not likely to affect results where there is gross focal atrophy, such as in ChAc. VBM also can only provide one-dimensional information about where differences between two sets of images are greatest, but cannot describe shape differences or differential changes between disparate brain regions, or their associations. As a result, an approach that combines both VBM and ROI methodologies is widely felt to be most powerful. The ROI method was an adaptation of a method previously described [4, 20]. Tl-weighted images sliced coronally were used to measure the volume of the caudate nucleus on contiguous slices in the coronal plane. The medial boundary was the lateral border of the lateral ventricle; the lateral boundary was the medial aspect of the internal capsule; the superior boundary was the most superior aspect of the caudate nucleus visualized; the anterior boundary was generally considered to be the subcallosal fasciculus; and the most posterior extension of the tail used as the posterior boundary when visible (Fig. 3). Images were manually traced using Analyze 7.0 software (Biomedical Image Resource, May Clinic, USA) on 30-60 slices, and the volumes from each slice were summed in millimetre cube, taking into account slice thickness of each coronal image. Fig. 4 Caudate shape [left (a) and right (b)] of 10 ChAc patients (thin lines) plotted against caudate shape, with measurements from male and female controls (thicker grey lines). The means of the patients' caudate volumes can be seen in the thicker black line. Gross volumetric reduction of the caudate is seen, particularly in the head differences. 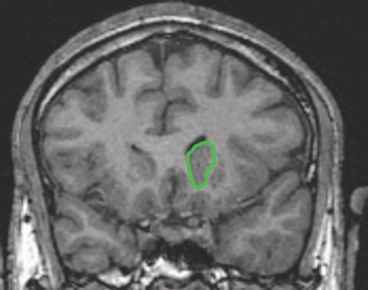 This method has been well-described for shape analysis of the corpus callosum previously . 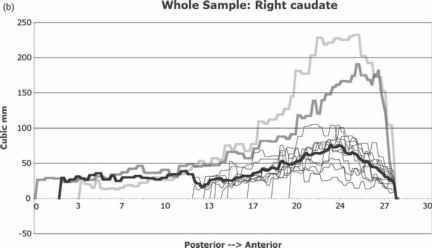 What this method has thus far allowed for is a quantification of total volume of the left and right caudate nuclei, and for visual inspection of shape changes. 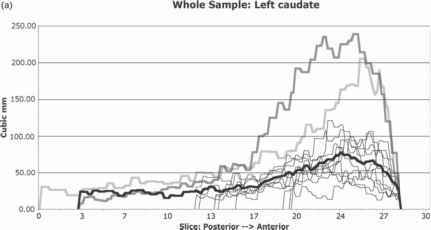 The mean volume of the left caudate in the patient group was 1,567(±556) mm3, and the right caudate 1,624(±551) mm3. Using the same methodology, the volumes of matched male and female controls were 5,308 mm3 (left), 5,074 mm3 (right) and 4,872mm3 (left), 4,872 mm3 (right) respectively. These volumes suggest that caudate volumes in ChAc are reduced by 50-80% compared to similarly aged controls, a reduction not seen in any other disorder. The shape plot from posterior caudate (body and tail) to anterior caudate (head), plotted against the volumes from healthy controls shows that the caudate is globally and significantly reduced in volume by 50-80% in most ChAc patients, with much of this loss coming from the caudate head (Fig. 4; to the right of each plot). This regional reduction matches the co-ordinates of the previously described VBM work, and the small number of neuropathological studies undertaken in ChAc.